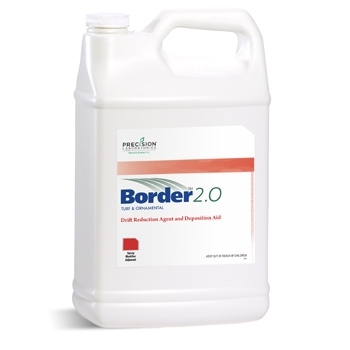 Border 2.0 is a concentrated liquid adjuvant for spray droplet management. It enhances the performance of spray applications by modifying the physical characteristics of the spray droplet, improving droplet retention while reducing off-target movement. Border 2.0 is a part of the Total Spray Droplet Management™ portfolio of products that improve safety and efficacy of spray applications. 0.25%–0.50% v/v (2–4 pints) of Border 2.0 per 100 gallons of spray solution.